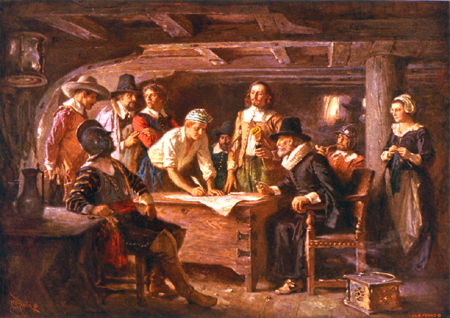 November 11, 1620 The Pilgrims signed “The Mayflower Compact” combining themselves into a “civil body politic to enact equal and just laws to serve the common good” in the cabin of the Mayflower before landing. This Veteran’s Day let us remember what our Veterans and our ancestors lived and died for. It’s up to us to spiral these principles and ideals up to greater heights and bring Liberty, Justice and Abundance for all! November 11, 1620 – The signing of The Mayflower Compact, an agreement, a covenant, that when combined with The Great Law of the Iroquois, became the foundation of the Constitution of the United States – a grand vision for humanity. Click here to read What does the Pilgrim Stand for in our National Life and Character? THE FORGOTTEN STORY: The Pilgrims and the Indians lived in Freedom, Peace & Friendship for 54 years! Revisionist History has twisted the tale! The seeds of democracy and the American Mind and Spirit were sown here. 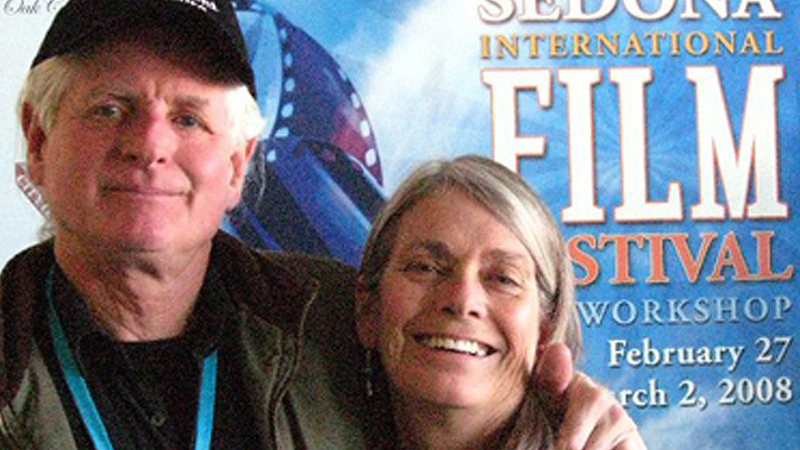 Thank you to all who supported our Indiegogo Crowd-Funding Campaign! We can’t do it without you! We’ll be starting a new one soon! In the meantime our fundraising is ongoing see PayPal Donate button below. Watch our 3 minute video and get the gist of what we are bringing to the table. We are revising revisionist history!! It’s time to be inspired! 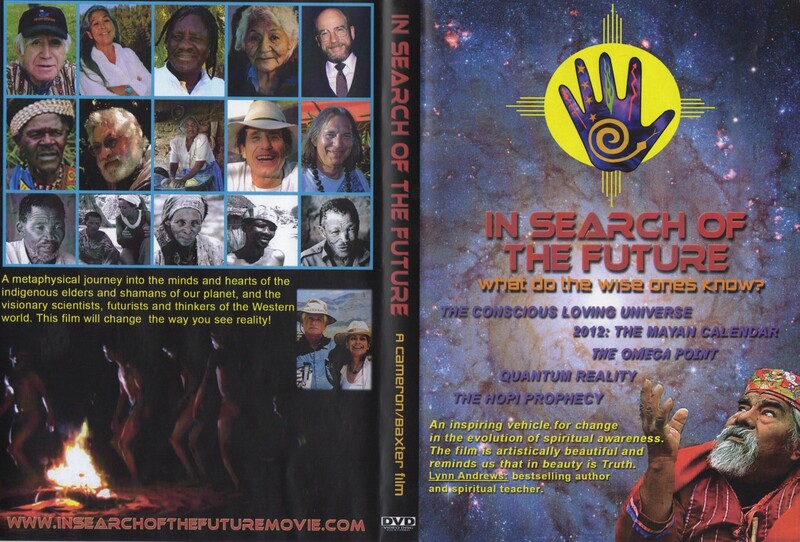 Andrew Cameron Bailey and Connie Baxter Marlow, director/producer at Cameron/Baxter Films, creators of IN SEARCH OF THE FUTURE: What do the Wise Ones Know? and THE TRUST FREQUENCY: Ten Assumptions for a New Paradigm, are making an inter-cultural documentary that will inspire every American and anyone interested in history, freedom, democracy and high drama. This film will restore the historical balance and change the way Americans think about themselves, in very positive way! Please Support This Important Project! The Past: Historical misrepresentation. The Indians have been stereotyped and marginalized for hundreds of years. Their role in the evolution of democracy has been ignored. Colonization has taken the Indians’ lands and destroyed their culture, resulting in bitterness, resentment, and anger. The Present: Misinformation has been disseminated about the Pilgrims in a misguided effort to correct the imbalance and honor the Indian. Shame, guilt, ignorance and lack of concern on the part of the whites. Distorted history widely believed. A nation morally paralyzed. The Future: Restoring the balance. Honor as the healing balm. Recognition and acknowledgement of the role both the Mayflower Pilgrims and the Native Americans played in the evolution of the principles and ideals that were the seeds of free government. The inspiring model of visionary leaders bridging great gulfs of difference to live in peace and friendship. A once-in-a-lifetime opportunity is at hand. The year 2020 is rapidly approaching, the 400th anniversary of the landing of the Mayflower, and the half-century of intercultural peace and friendship that ensued. No one seems to remember this. We have all been duped by revisionist history. It’s time to clear up the confusion, and return to the beautiful, inspiring story that underlies America’s origins. Will we, the people, ever fulfill the promise made in our founding vision, the promise of Liberty, Justice and Abundance for all? Or are we morally paralyzed because we are ashamed of our Origin Story? This timely film will set us free from the anger, blame, shame and guilt that now shroud an unprecedented time in the history of humanity – the period during which we made the radical move from monarchy to democracy, the separation of Church and State, self-determination, and consent of the governed. A true quantum leap! Out of this evolution, informed by interaction with the indigenous peoples of Turtle Island, came a new nation, a nation of the people, by the people, for the people. Partly because, 400 years ago, two inspired leaders, one English and one American Indian, kept their people in peace and friendship for over half a century. There is a disturbing situation centered on Plymouth, especially at Thanksgiving, distorting indisputable historical facts about that half-century of harmony. The Pilgrims have been dishonored. They are accused of crimes against the Indians, crimes they did not commit. Google “the real Thanksgiving” or “the truth about Thanksgiving,” and you will see what we mean.The true nature of the friendship between the Mayflower Pilgrims and the Pokanoket Indians is now mired in misinformation, misbelief, ignorance, shame, blame, anger and guilt. Our school and college textbooks have been revised in the interests of “political correctness” and now contain unpleasant “facts” that are completely untrue. 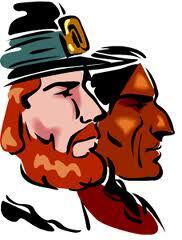 Please see: PILGRIMS AND INDIANS: Ten Common Misbeliefs. An inspiring inter-cultural story lies at the founding of the United States? The Mayflower Pilgrims were different from the Puritans, who came in 1630? The Pilgrims and their Indian friends were spiritually aligned? 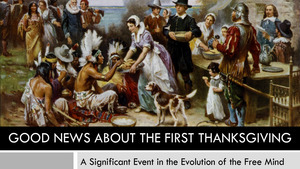 The Pilgrims and the Indians played a role in the evolution of democracy? They lived in peace & friendship from 1621 – 1675, more than half a century? America’s Origin Story is currently mired in misbelief and misinformation? 400 years ago a synthesis occurred, creating a new mind and a new spirit – a vision of freedom, independence and self-determination. The Mayflower Pilgrims and the Pokanoket Indians lived in peace and friendship for more than half a century. The English and the Indian came together, and for a brief shining moment showed us what is possible. They set an example of how America could have been, if the “Plymouth Paradigm” had prevailed. The inter-cultural exchange at Plymouth Plantation gave birth to a promise America has yet to fulfill. November 9, 1620: An English ship called Mayflower makes landfall at present-day Cape Cod, Massachusetts, carrying the seeds of American democracy. The 102 passengers seek to establish a colony based on freedom of conscience and freedom of religion. Before setting foot on American soil, they draft the famous Mayflower Compact. a civil agreement which will govern their behavior once they establish the proposed plantation. March 21, 1621: Half of the Mayflower passengers have died of illness during the brutal first winter. More than three months after coming ashore at Plymouth, the 52 surviving English fathers, mothers and children meet Samoset, Squanto, the neighboring Pokanoket Indians, and their leader Massasoit, in circumstances little short of the miraculous. The two visionary leaders craft a mutually-beneficial treaty that both parties will honor for the next 54 years. THE FIRST FIFTY YEARS corrects a number of widely-held historical misconceptions, but more importantly, it takes the “high road” and explores the question: what was the common bond that kept these two completely different cultures in harmony for so long, while all around them was danger, competition, intrigue, war and dissension? Far from warranting blame and shame, the Pilgrims and the Pokanokets both deserve honor for their visionary alliance and their impeccable behavior toward one another. The timeless Pilgrim/Indian story has never been told from this elevated perspective. THE FIRST FIFTY YEARS – WE ARE ROLLING! UPDATE! 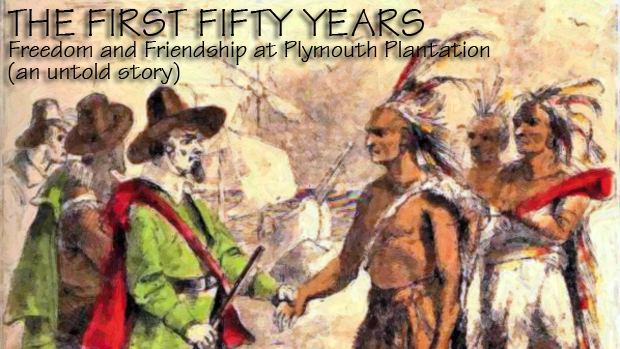 We are thrilled to report that our documentary/book/screenplay venture “THE FIRST FIFTY YEARS: Freedom and Friendship at Plymouth Plantation” is rolling! We have just filmed the first interview for the documentary film aspect of the project. 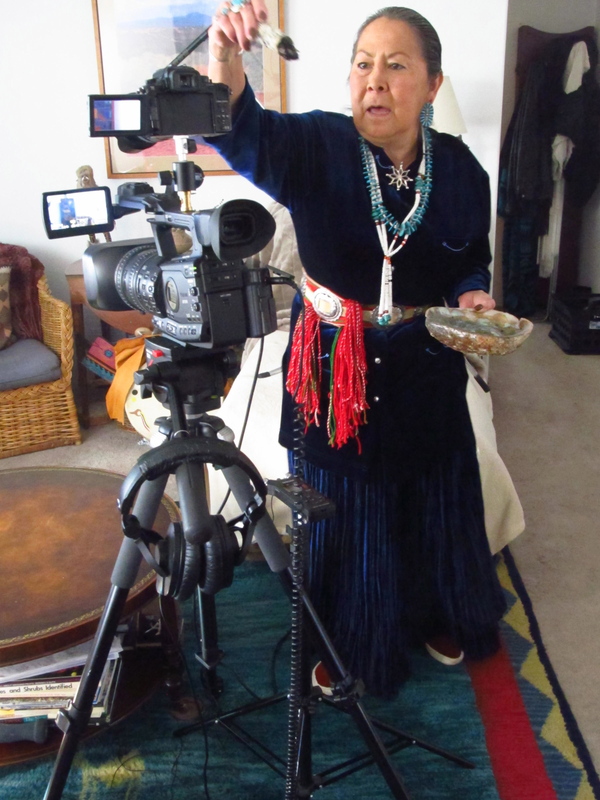 Mary J. AshkiiLgaii Wheeler, Navajo elder, smudges (clears the energy field) of the new cameras with sage before the first shoot. A traditional Native American practice. We’re now available for hire, and the additional income will help us to realize THE FIRST FIFTY YEARS project. 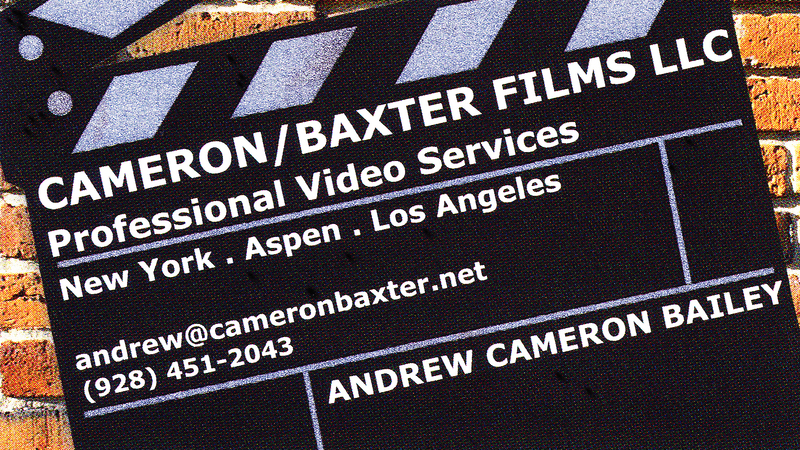 The Cameron/Baxter Films business card. The vision and mission of THE FIRST FIFTY YEARS project is to inspire America and Americans by bringing America’s origin story into balance and honoring the Mayflower Pilgrims and the Native Americans for their role in the evolution of democracy and the American mind and spirit. The project will also correct a number of misconceptions about the relationship between the Pilgrims and the Indians during the first fifty years of Plymouth Colony. We launched the project with a talking circle at the Third Street Center in Carbondale, Colorado, just down the valley from Aspen. Two Native Americans joined the circle. They expressed two very different but highly relevant perspectives on the challenging situation we are addressing. The following week we filmed our first interview using the new equipment, with Navajo elder Mary AshkiiLgaii Wheeler (center of talking circle photo) speaking of love, unity and understanding the Oneness of all things as a pathway to healing. Our fund-raising is ongoing. We need funds to get to New England in the spring and spend six months shooting our documentary, finishing the research and writing the screenplay.INSPIRE AMERICA! DONATE NOW! This project it the outgrowth of a life-time of experiences and explorations for both of us who have authored the book “THE TRUST FREQUENCY: Ten Assumptions for a New Paradigm” and produced the film “IN SEARCH OF THE FUTURE: What do the Wise Ones Know?” Through books, films, photography exhibits and other events we have been bringing indigenous cosmology into Western thinking for over 30 years. Our underlying premise is that the prevailing paradigm is missing important information, which has led to a world out-of-balance. THE FIRST FIFTY YEARS is America’s origin story! It is therefore important. It is inspiring. It is impeccable. Inspiration can lift us to to new levels. We can each contribute to bringing the world into balance by shifting our perspective, examining our beliefs and realizing the vision the founders of America – both European and Native American – had/have for humanity! 3. 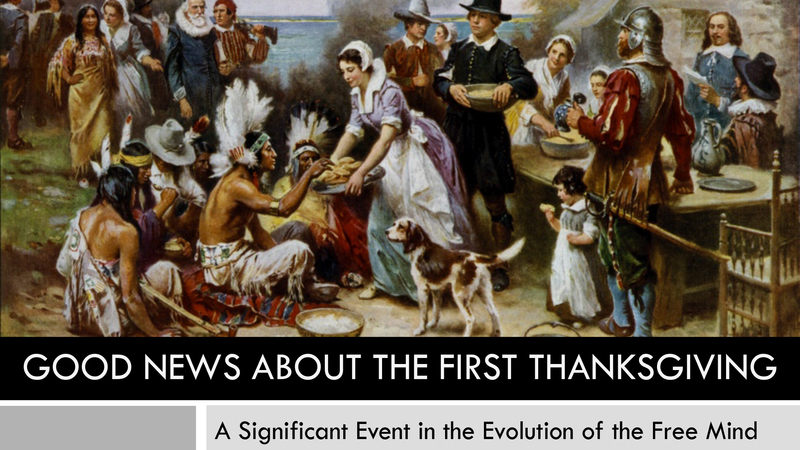 Correcting the misinformation and misconceptions concerning the Pilgrims and the Indians and America’s origin story. 4. The inspiring story that sits at the founding of this nation – an exception to the human condition then and now.